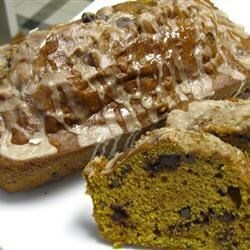 "Glazed pumpkin bread with chocolate chips. This is really good stuff." In a large bowl mix together the flour, baking soda, 1 teaspoon cinnamon, 1/2 teaspoon nutmeg, ground ginger, and ground cloves. In a separate bowl cream together the sugar and butter or margarine. Add eggs and beat until smooth. Alternately add the creamed ingredients and pumpkin to the dry ingredients. Fold in chocolate chips and chopped nuts. Spoon into two greased 9x5 inch loaf pans. Bake in a preheated 350 degree F(175 degrees C) oven for 45 to 50 minutes. To make the glaze: In a small bowl, combine confectioners sugar, 1/8 teaspoon cinnamon, and 1/8 teaspoon nutmeg. Add milk, and mix until smooth. Drizzle over warm cake. See how to make super-moist pumpkin bread studded with chocolate chips. This is an excellent recipe; however, I used 1-1 1/2 c. of pumpkin instead of 3/4 c. It was very, very good. I used fresh pumpkin and made muffins with this recipe. The icing is very good. An excellent loaf --- the first time I brought something to work that EVERYBODY raved about.